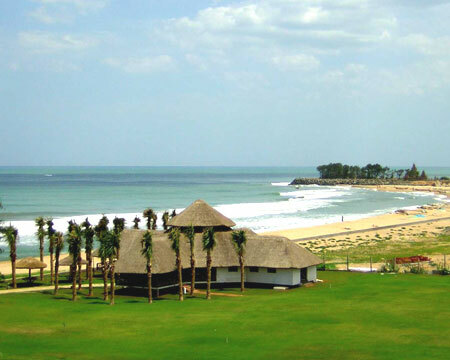 Mahabalipuram beach is located about 50km south of Chennai city in Tamil Nadu. It takes one hour to reach Mahabalipuram from Chennai by road. Most of the tourists visit the place as it is considered as a center of Pilgrimage. Many of the mythological events are attached to Mahabalipuram as well. It is also well known for temples bearing Tamil architecture. This place is popular for its stone sculpture industry. Many rock cut caves are also found in the town. But most beautiful among the entire natural sight-seeing is the Mahabalipuram beach. 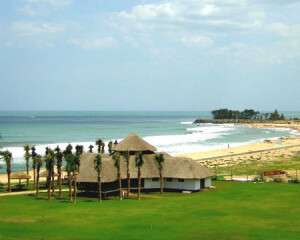 The beach at Mahabalipuram is also known as Mamallapuram beach. The beach is quite playful and is great for keeping the visitors engaged. The place is great for unwinding oneself. The temperature of the town remains high generally and humid atmosphere gives a unique experience to the tourists. Though summer brings much of the humid and hot atmosphere, visiting the beach in winter is quite fun-filling. The beach is fun filled and great for enjoying bathing and resting on the beach. As the current remains high, care should be taken during bathing. The tour on a sea cruise is another interest for tourists here on Mamallapuram beach. One can chose one of the cruises that move during sunset or sunrise. Visiting the sea during sunset or sunrise brings a unique and amazing beauty of nature to the front. It is really exciting to visit the sea when the sky is red and sun gets down to the sea. Apart from being a naturally beautiful beach, the Mahabalipuram beach is considered as a pilgrimage center. In the nearby area one can find many temples. The shore temple near the Mahabalipuram beach is also worth of visiting. The art and architecture of these temples keep the tourists engaged during the visit to the beach. The nearby place is Kanchipuram which is famous for being a pilgrimage center. One can reach in Kanchipuram within 2hours by road and the place is greatly revered by pilgrims. The beach at Mahabalipuam is quite alluring and it provides a lot of activities to stay engaged on the beach. One can get buses from Kanchipuram, Chengalpattu, Chennai and Puducherry to Mahabalipuram. Then one can hire a private taxi for the beach. The nearest station is Chengalpattu and Chennai is the nearest airport. The beach can be greatly enjoyed during winter. The right time to visit the beach is between October to March.